Gani arrived home from office and hanged his polo on the chair. 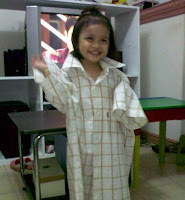 Reese was kinda playful that night and took her dad's polo and tried wearing it herself. She was so happy when we let her did that and in turn made her cute pose for this picture. She can read letters A-Z and numbers 1-9 since she was 20 months old. It's strange to me that she learned this faster than the primary colors. Recognizes shapes in things and food, especially when she's bored. (circle, square, triangle, heart, star, house, sun, house, T) - shapes from shape sorter. Could answer "What's your name?" fluently and use some phrases/sentences correctly. If she didn't find her slippers beside her mat, she says: "Slippers, where slippers, where? When I have to change her clothes, I have to say: "then raise your arms as high as you can", then she'll respond with: "and say.... Blast off!". She learned that from Little Einstein cartoon. Our term for fixing her hair is "parlor, parlor!". She likes repeating the words/phrases being spoken to her and she can pronounce most of the words properly. Her favorite toy nowadays is kitchen/food playset. She got lots of stuff toy but seldom touches them, maybe in time. Her favorite cartoons, Mickey Mouse Clubhouse, Little Einsteins, and Dora.